Project obstacles and solutions: The City of Jeffersonville, Indiana was building a heavy storage facility at their Water Reclamation Facility along the River Ridge Business Park. Cristiani Excavating was doing the design and build work on the structure. It required 8' concrete walls with a wood frame structure built on top of the walls. Since the project did not use a concrete pump to place the concrete, the trucks were sent up an earthen ramp to reach the top of the forms with their chutes. This slowed the process down and the temperature was very hot on the day of the pour. 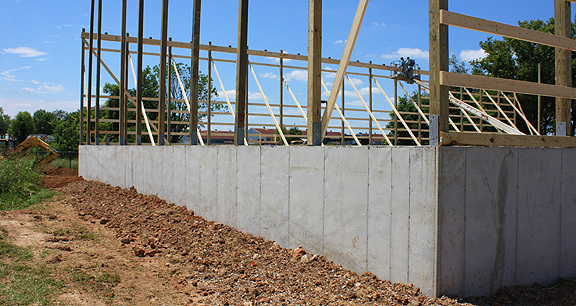 IMI suggested that Cristiani use imix EZ Wall concrete mix, which is formulated to slow set times when building walls in these types of conditions. The mix consolidated well. It was delivered with a 7-8 inch slump and remained plastic throughout the pour. No extra water was added to the mix during the pour. IMI delivered 100 yards of imix EZ Wall for this project. The walls were smooth, without any honeycombing when the forms came down. For more information on imix EZ Wall, click here.